Architecture is one face of the "art coi"b which has several faces and connected effects, and whose influence extends through the whole lifetime of the human civilization. Any careful observer would see how "Architecture" as an art, from the very beginning, controls the people daily life and future by imposing the nature of their use of the urban space in which they live. We can say that the effect of architecture on the human community is not less than its effect on the individual. We can easily monitor the change in life type that occurs to a family; here we admit that "family" is the primary community, as a result of this family move from one urban space to another. The architect, somehow, in several cases cannot predict the results of his interfere nor the range of socio-economic transformations that happen to this family after a while. Here we should put into consideration the socio-politics changes that form the general context surrounding this family. In the same way we can go through many architectural spaces used by the individual or the community in their various activities; whether economic like factories and markets, or places of service like hospitals, automated slaughterhouses, metro and bus stations, etc. These architectural spaces are planned and built to be socially-used for the service and development of the society. However, they can be discovered after using them for a while that they are no longer fit for the function they were built for. Or the society itself may pass through certain change that makes the existence and continuity of these spaces undesirable. This can make them unwanted and neglected spaces. Moreover, rumors and myths may be spun about them just to emphasize their dereliction after the absence of society's capacity to develop or recycle them. What we aspire to is participating in creating a better life for all members of the society; through creating, activating and running a contemporary cultural reality able to be renewed and to interact with all historical variables as well as with the other; which leads to exchanging experiences and knowledge between cultures, and producing contemporary art that will express the state of society here and now in our daily-lived reality for the generations of near and far future. Having this as our vision and ambition, there are many problems and difficulties we have to face. They vary to include the conflict of civilizations and cultures between people from different countries, and then between classes and variations of the same society and up to the nature of society use of architecture types it produces and how they influence its type of life, how these types cannot, sometimes, predict the future problems of this society, and consequently the inability of these architectural types to deal with and solve these problem because they, simply, could not realize them from the beginning. For example, if we look to the different industrial architectural spaces like petroleum refineries, petrochemical plants and buildings of extinct industries; we can surely realize that they were planned to be built away from the urban zone of the towns. But after not so long time, towns creep towards these spaces. Over time, the importance of these spaces existence increases and new communities with complete socio-economic life grow around them. A life whose main center is living around these industrial architectural spaces regardless of these polluted environments and their unhealthy implications. However, I expect after not so long these buildings will lose their role, especially with the end of the era of oil and its derivatives, and new buildings, with strange architectural nature, will appear within, not out of, most big cities in the world. I expect the general trend, according to the international investment fever, will stimulate the society to recycle the land of these industrial/architectural spaces to be housing communities. Nevertheless, I think that any housing exploitation of these spaces is completely wrong as they werenbt originally planned for this purpose; whether during the life of the industrial space or during the urban creep towards and around it. Here we should note that such problems exist in different forms in all cultures, countries and all places with their different topographical, cultural and even economic variety. As I mentioned before, architecture is one face of the multi-faces and Omni-effect "art coin". Sometimes architects plan and build for the future what they see suitable for life now, but over time some shortcomings appear; resulting in architectural spaces neglected because of its being outdated or badly-used. Here the other faces of art are able to overcome this problem by recycling these places to be artistic spaces where theatre, music, visual arts and other contemporary arts are practiced. This would be like a reconsideration of these neglected architectural spaces as well as it would affect, so quickly, the other aspects of human daily life in the environment surrounding these spaces, especially the economic ones; through reviving them after being neglected for so long. New focuses of human activities will be created, around them waves of socio-economic movements will be formed; giving back to the areas of these previously neglected spaces their lost vitality and making them able to coexist and compete with other more vital spaces, and this will enrich the whole society life in general. But we should take into account the necessity of studying each neglected space apart and suggesting the artistic approach of dealing with it. The solution here has its pure artistic introduction which integrates with the "artistic" role of architecture. are completely good examples of the indirect effect of artistic activity on these spaces, on the different aspects of human activities whether economic, social or even political. For example, what happened in El Max when the decision of demolishing the buildings of the village after we recycled one of these buildings to be a space for different arts, how the existence of this artistic space had its effect on re-planning the urban space of the village after the emergence of a square for the village. The buildings of the village were restored artistically through many collective artistic activities which slowly built a kind of pressure on the executive authorities of Alexandria governorate to stop their plan to abolish the village and, moreover, changed the bad reputation the Alexandrians had about the village in general. I think one of the most important aspects of this concept is how these newly-rediscovered spaces play an effective role in developing the socio-economic environment around them. 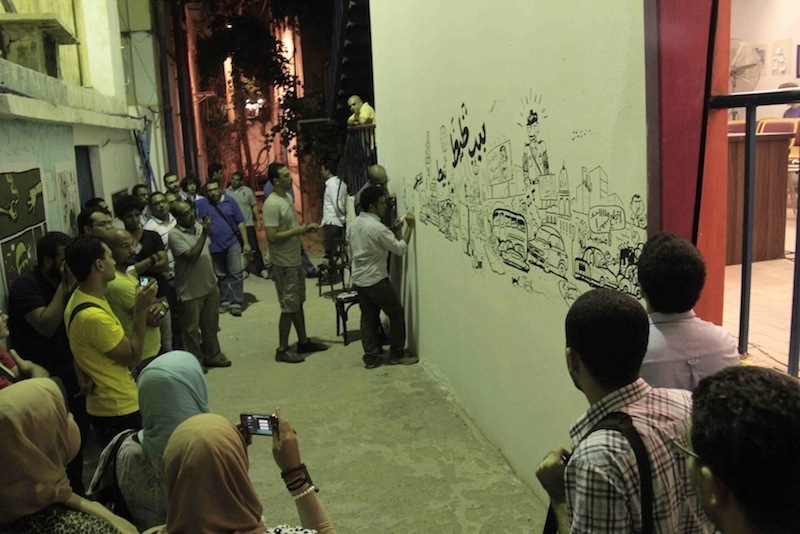 This stimulates the community to rediscover its potentials and to voluntarily present these neglected spaces for art and artists after realizing their role and its importance; supporting the general concept of sustainability. This is what happened with the case of El Cabina, when the owners of the space came to us in Gudran Association for Art and Development to recycle the space to be an artistic one; believing that this artistic space will play a role in creating a state of economic boom for the urban area around it, and it will be a point of meeting, communicating and exchanging knowledge and experiences among different social categories in all Alexandria. Every rediscovered neglected space has got special characteristics whether architectural or topographical, or through its relations with other spaces in its surroundings. So, it is natural that every space has got a different access or approach for artistic work which can make the surrounding community understand and appreciate its necessity. Here what the society presents is one of its underlying resources for supporting its culture and financing it without even paying money or effort, but it would be a new resource: indirect, effective and able to make the aspired change for each society that suffers from economic and social problems while it has got many neglected spaces. Eventually, I think the progress of humanity and industry will always give art the chance to exist in new places and architectural spaces which should be artistically recycled after a certain industry dies out or has to go away from its original location after the urban life creeps around or neglect covers it. Thus, the culture of these places is self-supported and gets a chance to develop and interact within a contemporary context again. SAMEH EL HALWANY (Writer): Visual artist and General Manager of Gudran Association for Art and Development in Alexandria, Egypt. ABDELREHIM YOUSSEF (Translator): a poet, translator and English teacher, he is the artistic coordinator of the literature program of El Cabina at Gudran Association for Art and Development in Alexandria, Egypt. 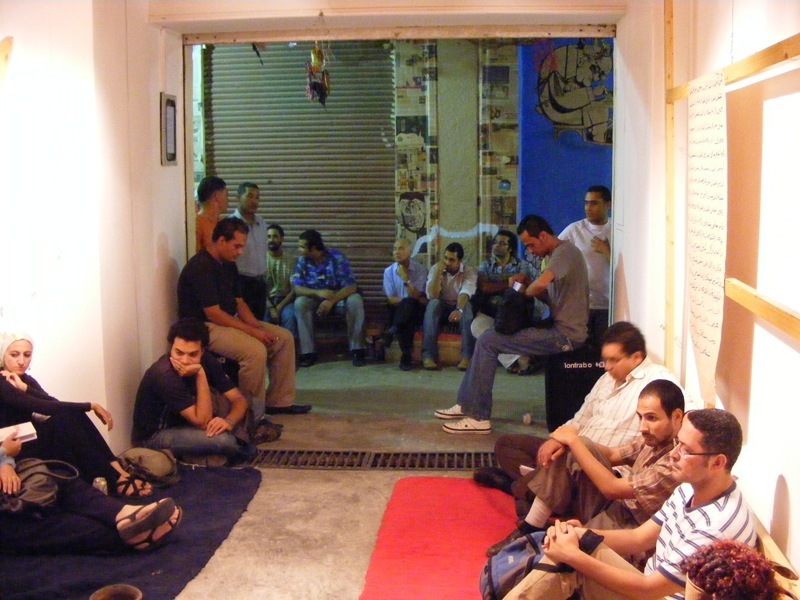 El Cabina (Cabinet): is a new art space in Alexandria, envisaged as a space for experimentation and rehearsal by young local artists, musicians and writers. The focus is to work on developing new and young audiences and to provide services to emerging artists. By creating a cafe and a reading room with WIFI access as well as creating an affordable membership scheme the new space will attempt to attract new audiences as well as generate some earned income. Located in what had been an abandoned technical room of an old famous cinema, "The Rialto" and with its own public access to the street, the Cabinet will provide an alternative for both artists and audiences by presenting a safe space for experimentation, rehearsal and presentation of local cultural production. Aside from that, the Cabinet space will provide training spaces and different and diverse learning opportunities. A major component will be a music studio and jamming rehearsal space for local musicians and bands as well as performing arts/theater artists and the opportunity to present works in progress or small events/performances. The space will also have sections dedicated to the presentation of visual arts.